Old and New ~ The offices of Hampshire County Council form a backdrop to the Hampshire Jubilee Sculpture by Rachel Fenner. 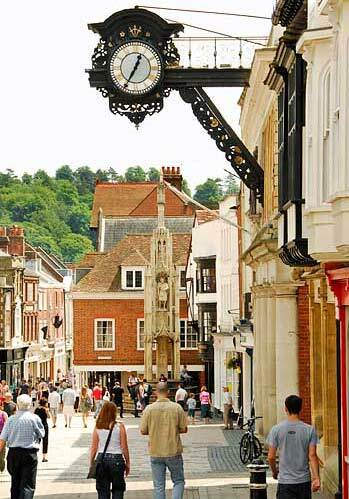 The sculpture was inspired by Winchester'’s Castle, Cathedral and Hampshire's rich natural resources. The segments in the outer circle form a Round Table. One half, decorated with fleur-de-lys and castles, symbolises the reign of Edward I and Eleanor of Castile during which time the Round Table (see below) was probably made. The other half illustrates religious presences using arches and arcades. The flowing design in the centre circle recalls the wet lands around Winchester Cathedral. 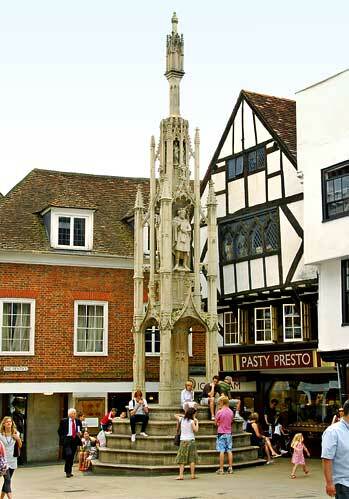 The focal point is a large stone, the"Throne" surrounded by three guardian figures, which reflect Winchester's position as a traditional home to monarchs and bishops. The "Alfred" stone symbolises ancient days and embodies the great King's dedication to art, religion and defence of the realm, it also refers to Winchester's Royal connections over a long period, Capital City of England, Capital of Wessex, Royal Mint and Royal Treasury to name just a few. The "Mitre" stone represents the authority and influence of the Christian Church. The "Overflow" stone refers to the rich resources of Hampshire that assisted the early growth of the country and which continues today. 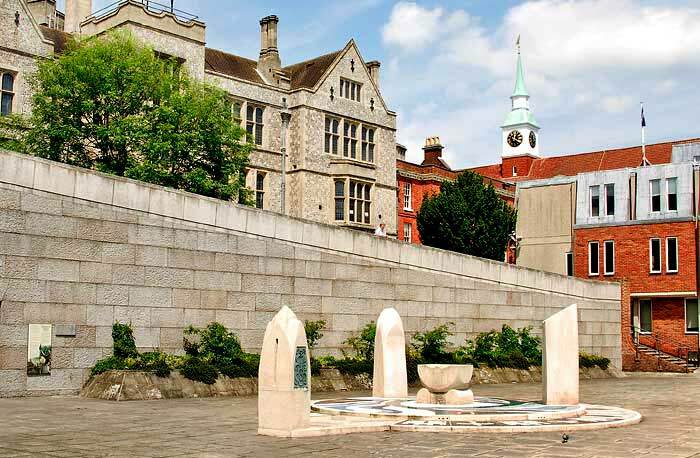 The sculpture is located within the precinct of the Winchester Law Courts. Elizabeth Court, the county council headquarters. 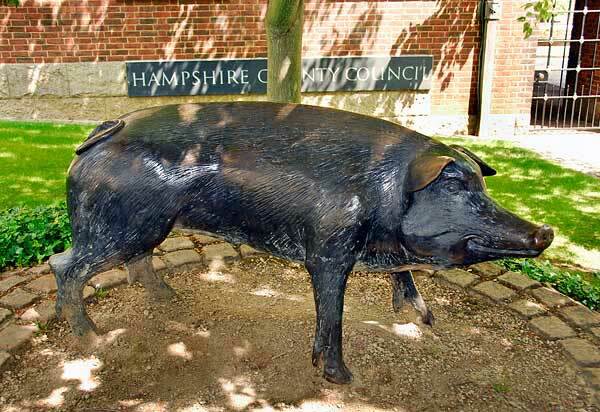 It's unknown when the Hog was first associated with Hampshire. The first pictures are on the coins of Verica in the early 1st century which shows a boar on the reverse. Verica was a South Belgic King who ruled a district which included Hampshire. By the 18th century the term had became well established and found its way into a dictionary, even though its origins were obscure. Most people who use the nick-name Hampshire Hog think of a pig and the most popular belief to its origins is simply that Hampshire bacon has always been among the best produced in England. 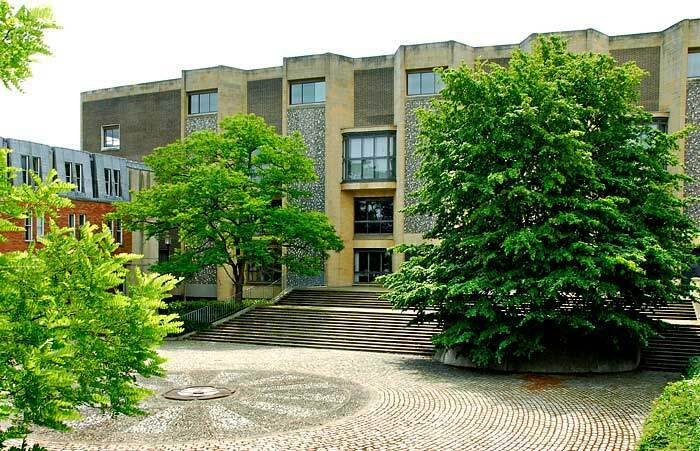 The new and the old - Winchester Law Courts with the Hampshire Rose emblem in stone sets was built in the 1970's to replace the Great Hall below. 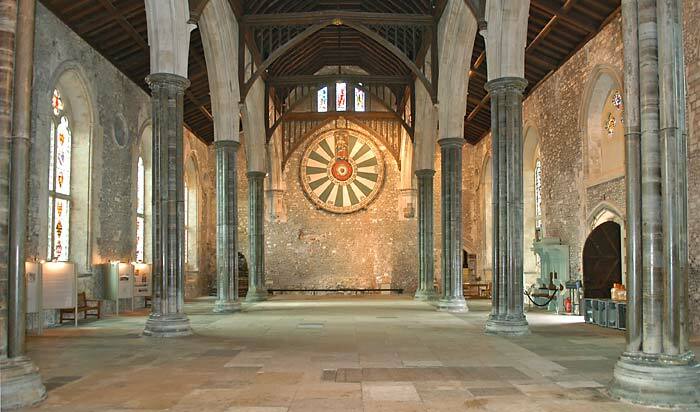 Winchester's Great Hall was built between 1222 and 1235 and is said to be one of the finest of all 13th century halls. 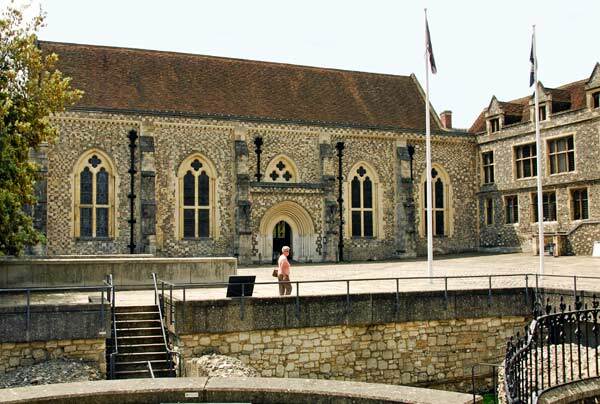 The hall is all that remains of Winchester Castle after Oliver Cromwell ordered its demolition after its capture by Parliamentary Forces in 1646, the Great Hall was spared and kept as a venue for assemblies and the County Assizes. Today it houses the symbol of medieval mythology "The Round Table of King Arthur", - under which the Assize Judges sat - it's now known to have been made in the 14th century, and repainted in its present form for King Henry VIII. 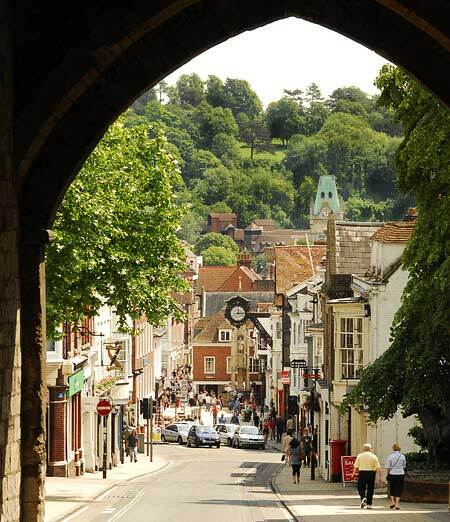 The view from the late 13th century West Gate looking east down the High Street. old gateways to the city, the other being Kings Gate. 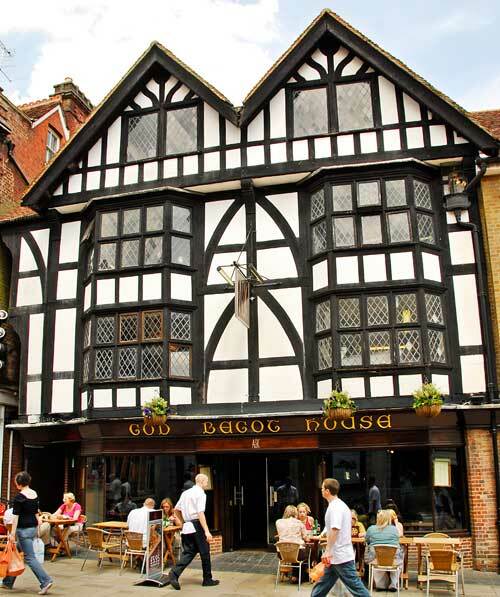 The 16th century God Begot House. The sides and back of the building are fairly close to their original condition with plaster infilling and timber framework, while the side that fronts the High Street has been heavily restored. The building is situated on the site of the Manor and Sanctuary of God-be-Got, an ancient enclosure independant of the city from 952-1541. 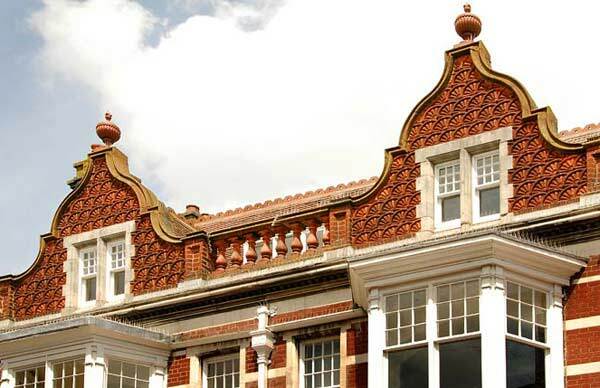 A number of the buildings in the High Street have ornate red brickwork at roof level. The early 15th century High Cross is also known as City or Butter Cross. The tall many pinnacled cross has five octagonal steps used by countrymen to sell their produce, hence the name Butter Cross. 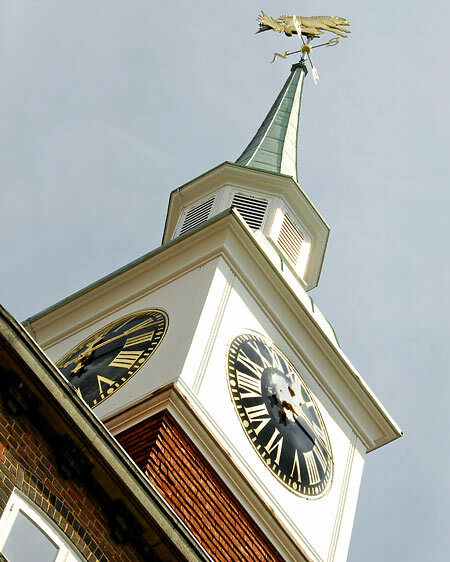 The town crier also used this spot to announce important news to the people of Winchester. 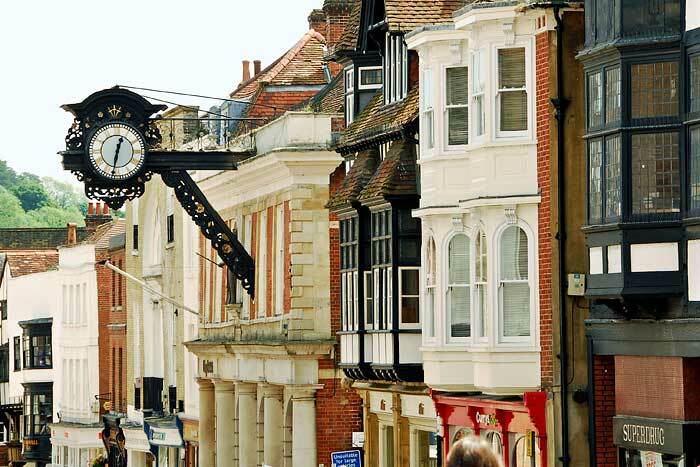 The early 18th century clock on carved timber brackets above Lloyds Bank, formerly Winchester's Guildhall.